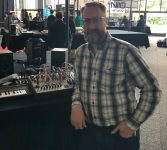 James Coker, owner of the company Five12, announced that his Vector sequencer will go into production soon. The module is a digital composition tool with eight tracks. Each of them features two sub-sequencers for internal modulation. An extensive set of chance-based functions, including options like random ratcheting, pitch and playback alterations plus mute options, allow you to create variations of sequences on the fly. Two new features, which James announced at Superbooth 2018, are a chord mode and a record thru function. Patterns can be organized in playlists to create songs and live sets. 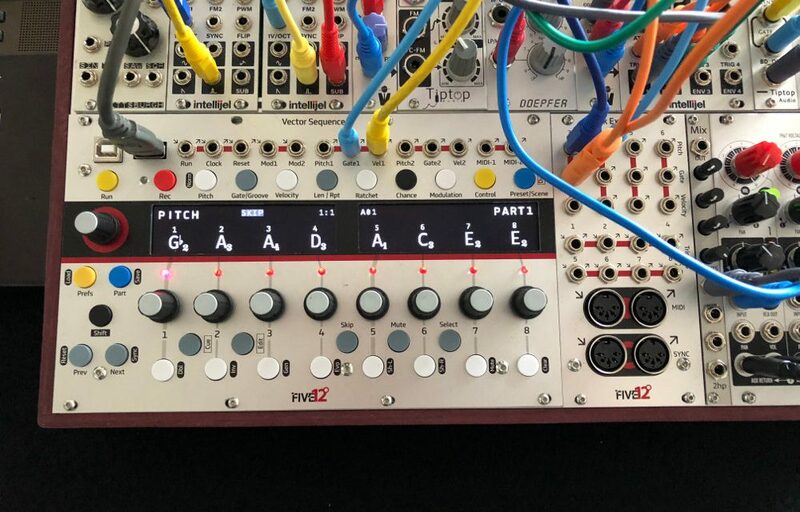 Thanks to two OLED displays plus a total of nine encoders, a piano-style button matrix and other control elements, operating the Vector is easy as pie. – Despite its high level of sophistication. The Vector itself offers analog outputs for two tracks. In detail, it emits pitch, gate and velocity signals. Additionally, there are two 3.5 mm MIDI connectors and both USB A and B ports. Three bi-directional trigger sockets can be used for sync, clock and trigger functions. On top of that, there are two CV inputs, which allow you to feed external modulation signals to the sequencer. Incoming control voltages can influence various parameters. If this configuration is not enough to fully control your setup, it is time for the Five12 Jack Expander. This module adds four more analog output sets, each consisting of pitch, gate and velocity connectors. Furthermore, the Jack Expander features eight more bi-directional trigger sockets, a MIDI DIN input and output plus DIN Sync ports. You can freely assign all these connectors to the sequencer tracks. A micro-SD card slot is installed on the back of the unit. There are auto-saving and load functions, so you’ll always have the last session at hand when you switch on your modular system. The USB A port can be used to transfer data to your computer, meaning to create a backup. Vector and Jack Expander will be available for pre-order at SchneidersLaden soon. James said the prices will be 699 USD (Vector) and 359 USD (Jack Expander). Prices in Euro have yet to be determined. The Vector will be available in August. Its Jack Expander will follow about a month later. Video Artists in NL ..